Debt Free Saver | Young, poor, and saving up-but not climbing out of debt. First off, I know it’s been awhile. I’ve been finishing up at my job, moving, unpacking, starting school, etc. The blog was kind of my last priority, which is bad. One of the points of this blog is to keep me on track, and I haven’t stayed on track. Actually, I’ve been pretty good about larger purchases, but as usual I’ve spent a lot on food. As I get settled in, that should be less of an issue. As for things that aren’t food (and occasionally for food), I thought I’d do a summary of how I try to save. First I search online to try to find the best version of what I am looking for at the best price. Sometimes quality is more important and sometimes price is, but I always try to get a good balance. I also try to take into account whether it is something I can buy used, do without, or get for free. When I wanted Dance Dance Revolution I knew it was something I could do without, so I waited and managed to get almost all the components I needed to play for free from friends or swaptree. When I wanted a new dresser I went with the cheapest one that did not have terrible reviews. I could have gotten one for free or cheap used, but I did not have the resources to move it without spending more than I would have just going to get a new one. Once I find the one I want to buy (assuming I am buying it, and buying it new) I see how else I can save. With Bed, Bath & Beyond it is almost always cheaper to go to the store assuming you don’t make up the difference in gas. You don’t have to pay shipping and they accept expired coupons, and you can almost always find a 20% off coupon. Other places, it varies, and you might not have access online. I usually go to retailmenot.com to find discount codes, and/or search for coupons online. I also go to mypoints.com to check if the place I am buying from is a sponsored merchant. If it is I can get points for shopping there that I can use for a free gift card. They have gift cards to a ton of different places and I manage to rack up a lot of points just doing this and clicking the links they send me in emails without actually buying from those links. If you’re interested in starting a mypoints account, by the way, let me know so I can send you a referral email and get more points for that. I’m saving for a Target giftcard at the moment. Whenever possible I purchase the item with my cash back credit card. Lastly, planning in advance is my friend. I can watch for deals and sales, and if I’m ordering online I can choose the cheapest shipping method. How do you guys shop that I am missing (besides for clothing)-I know Ali has an awesome method of shopping all the time that lets her buy things she really likes at great prices, but it doesn’t work for me right now. Any other tips would be greatly appreciated. I think moving is one of those things that really motivates me to spend, spend, spend. Of course, when you’re moving into a new place, or at least when I am, is usually a terrible time to spend. You have to pay a deposit, rent, sometimes first and last month and a broker’s fee, you need to pay for gas to drive your stuff there, etc. You need to either hire movers or buy food for the kind friends that help you, or maybe just be super mighty. I am not super mighty, by the way. But a new place needs new stuff! When I moved into my last place I needed a tv stand, and door hooks, and baking supplies, and all new bathroom stuff since my old stuff didn’t match the tiles in the new place. 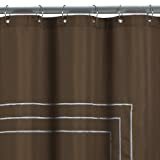 The shower curtain I totally, completely needed. And ended up not getting-I got a different one. I am lying. I didn’t need any of those things. But I wanted them, and they were useful, and I got them. It’s not bad that I got them. The problem is that I identified those wants as needs. Now I am moving to a new place again. I want a dresser, and new towels and maybe some baskets and a toothbrush holder for the bathroom, (what can I say, I like matching bathrooms,) and a rug and a new litter box, and probably some other things. The dresser is practically a need, since otherwise there is nowhere for my clothing to go except in a big pile, and since I have no car it makes sense to get a cheap new one that can be delivered. The bathroom, well, if I see it cheap I will probably get stuff. Matching bathrooms make me happy! I only want a couple things, and, well, we have to give into wants somewhere. The rug I am going to try and trick my boyfriend into buying if I am getting the dresser. The new litter box is a straight up luxury, and I am going to skip it-I just one that looks nicer since it will be more visible, but the one I have is covered with a dome and looks fine, and I can maybe put an end table we already have over it. I have to be strict with myself! As J.D. at Get Rich Slowly always says, nobody cares more about my money than I do. Nobody else is going to make sure I don’t waste money that could go towards a down payment on a cute lamp I’ll probably leave behind when I move. I also need warm things since I am moving to a colder climate. There, at least, I’m excited to not spend. I realized I have a winter jacket from high school I can use. It’s 10 years old, but I’ve barely worn it in that time and it’s super warm. And since it’s from 10 years ago, it’s probably back in. Or, I don’t care, because it’s warm. I already own scarves I also don’t wear, and my mom is always trying to give me gloves so I can just actually take some next time she offers, or find some that she gave me in the past. What can I say, I hate bundling up as much as I love matching bathrooms. I’m all about the hoods and use of pockets. I do need to buy new boots though. All my current boots were bought with motivations other than surviving a New Hampshire winter. I almost bought some Bear Paws on sale at Target the other day, but with shipping I felt they weren’t worth it. So, any recommendations for cheap, warm, tough (or tough-ish) boots? Or ways to not spend on a new place? So I am kind of sticking to weekly updates. Kind of. As for my budgeting goal of $300, still looking good-I think. It is after the 15th, and I’ve only spent $280 on food, moving, gifts, travel, everything but rent. So in that way, I succeeded. On the other hand, I still have one and a half gifts to get and those will probably come to more than $20. On the bright side, I made $110 selling stuff I didn’t need on craigslist, and tricked people into taking some of the rest of the stuff I won’t need any more. One of the best ways I can save right now is by having less stuff. Plus, free money! On another down side, I still keep spending way more on food than I intend to. I am trying to come up with a reasonable food budget for the next four weeks and it’s really hard. I know I spend too much, but what’s a limit I can set that I won’t break? Is it better to set an overall budget, a budget for eating out and eating in, or a budget and a set number of times I can eat out? I think an overall budget makes the most sense, but I also think it might be harder to stick to based on past experience. Advice totally welcome! I’ve been reading about restaurant.com for a while now in various saving money advice places, but hadn’t checked it out. Today, someone posted in one of my communities that you can get 80% off with the code SANTA, and I had no food for lunch, so I figured I’d give it a shot. The site offers discount gift certificates to tons of restaurants. I doubted many places I know would be on there since I don’t go to many chains, but there were tons of places less than a mile from my work, including a place I’ve been wanting to go to for a while. I ordered the gift certificate-$10 value, normally $3, but $0.60 with the code! Sixty cents! There were a bunch of qualifiers, but they didn’t matter to me-you had to go for lunch, which was my plan, and spend at least $15 total, which was no problem. I went with a friend and split a huge delicious lunch. We even had leftovers. The total per person ended up being less than $5, including the $0.60 spent on the gift certificate. The point here is not just to check out restaurant.com, which you should. The point is, I’ve been reading about this site for probably over six months and always figured it’d be too much work, but it was super easy. It reminds me of starting my savings account; I put that off for months and then it took about two minutes. If there’s a way to save you’ve been meaning try but think it’s too much effort, give it a shot. Go do it now, I dare you. So I’m moving twice in a little over a month, and moving stuff to three locations. It’s pretty nerve wracking. Or, it is for a likely-to-be stressed person like me. But this blog isn’t about stress (well, sometimes it is)-it’s about saving. I’m planning on saving on boxes by using discarded boxes from work. If you don’t have boxes at work, you can try grocery stores and liquor stores, and sometimes drugs stores, for the boxes shipments come in. Be friendly and willing to accept a no when you ask for boxes, but also try to find out what day they get shipments in since that’s when they’ll have a lot of extra boxes to get rid of. I am also getting some of the bubble wrap we normally throw away from work. it actually coincides well with my goal of cleaning out my office more-I used to stockpile bubble wrap for mailing things, and then never actually use it. I’m also planning on grabbing a bunch of the free newspapers available at the subway station. You can always try craigslist and freecycle. I see packing materials listed all the time on craigslist on my free in my neighborhood feed, and if they were nearby I would totally grab some. I’m also using craigslist to sell the big stuff I don’t need anymore. Even though I just bought some of this recently, it’s almost like free money, which is exciting. The rest of the stuff I am giving away for free, because, well, I like getting things for free. In fact, I am giving away a couple things I got for free recently, but that’s okay. As for my goals, it looks like I will make it and be under $300, but I still have to see how much gas ends up costing me, and am short a gift still. I broke it down into categories to help me not overspend. I’ve spent a bit too much on lunches, but I’ll just cut back on my dinners and/or miscellaneous fund to balance it out. Eating out is always my weakness. This is post three of a three-post guest series by Ali of Tattered, Tagged, Treasured on how she saved a ton without cutting anything they valued on her wedding. Post one is here, and post two is here. So, we had our caterer but no plates or silverware or linens. I looked into rental places and the lowest cost per tablecloth for tablecloths I considered fit to serve upon was $15 each. Screw that. 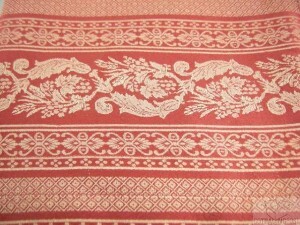 I bought about 15 matching tablecloths in various sizes that fit my wedding colors on eBay for less than $100 shipped. If you start early and you’re willing to use patterned tablecloths and be flexible, you can get an insanely good deal. For plates, we decided we didn’t care if every plate was different since the eclectic look, again, fits well with our theme. I picked a few up at tag sales, but I bought the bulk of them at Goodwill. FYI, you can bargain here, too! At our Goodwill, plates were $1 each. We bought 106 plates (every plate they had that wasn’t chipped or terribly scratched) for $70. We probably could have bargained even more, but at some point you just get tired and want to be done, you know? For my silverware, I didn’t care what it looked like as long as it had the heft of metal. Standard rates in a lot of places were as high as $1 per utensil. 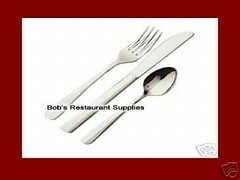 I went with this eBay store: Bob’s Restaurant Supplies. I got 432 pieces for just over $100 shipped. We wanted a lot of easily disposable stuff since we’re doing so much ourselves. I hit up Party City and spent $350 on all disposables. This was enough for all 70 people to have two rounds at the buffet, over eight drinks, plenty of passed cocktail food, two plates of dessert and one cup of coffee or tea. For our napkins, we went entirely with paper. For our dessert plates, we went with gold plastic. For our dessert forks, we went with gold plastic. For our coffee cups, we went with gold paper. For all drinks, including wine and champagne, we went with clear plastic. Sure, glass would have a much nicer heft, but this is something we didn’t feel it was worthwhile to schlep in or spend on. Rentals for glasses and linen napkins cost more than the total amount we spent on all of the disposable stuff and you don’t get to keep any of that, either. A lot of people choose to go personalized on all of this kind of stuff. We chose not to because it’s very hard to control the quality of what you’re getting and the plain stuff is ultimately going to look a lot classier on our patterned tablecloths. The best part is that we could open packages as needed and return some of it after the wedding. I like flowers, but the return isn’t worth the money to me, so only the wedding party bouquets was going to use flowers. Our centerpieces were large glass vases which we were going to fill with water and frozen cherries (to float). We spent between $8 and $15 on each vase. When I went to go get the frozen cherries, I couldn’t find any. On the other hand, roses were on sale super cheap, so we went with roses after all. 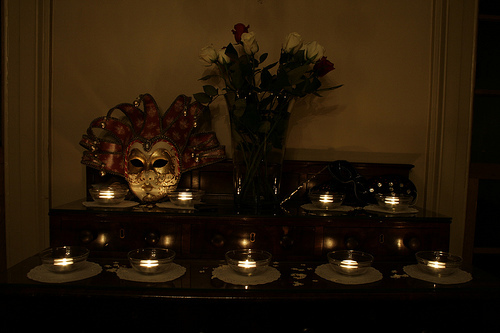 I had masquerade masks to hang everywhere and candles to place everywhere. The mansion is fully furnished and decorated, so that was it for decorations for us! Using what’s already there is a great way to save money and it lends so much personality and warmth to your wedding. Honestly, there are so many ways to save at your wedding. These are just a few of the ways I chose. Ali’s post about the wedding with links to all the photos from the wedding is here if you’d like to check out the end results and see if it looks like a frugal wedding. In my opinion, it was an awesome one. I don’t know about you, but I had a pretty great Thanksgiving. Now I’m back, vacation over, and it’s time to assess what I’ve done and what I’m going to do. First off, I was included in The Carnival of Personal Finance for my post on holiday gifts, which was pretty cool. Mighty Bargain Hunter is a really good blog, and a lot of the posts are pretty interesting, so I suggest checking it out. I always love reading these things (even when I’ not in them) because there is almost always at least one post linked that gives me a new idea or helps me get motivated. 1. Implement my new weekly budget system and stick to it. Not so good =( I think I need to start doing weekly checkup posts again if I want to stick to a weekly budget. 2. Use images in my blog. Very good! I only made 7 posts in November, but 5 had images, and I do think it made the posts better. 3. Make things new. I mostly did this on a larger, more metaphorical level, but I still feel I succeeded-I re-focused and gained new perspective and appreciation on things I already had in life. Sounds cheesy, but it is true. And I love cheese. As for my December goals, those will be divided into two chunks since I am making Dec.15th-Jan.15th one chunk, of time with one goal, as I mentioned previously. For the next two weeks the goal is to not spend more than $300 on gifts, travel, eating, and moving. I think this is fairly do-able =) My other goal is to make weekly update posts again. I am really happy and excited, December looks like it will be a good month.